Electrical Seminar on November 5, 2016! 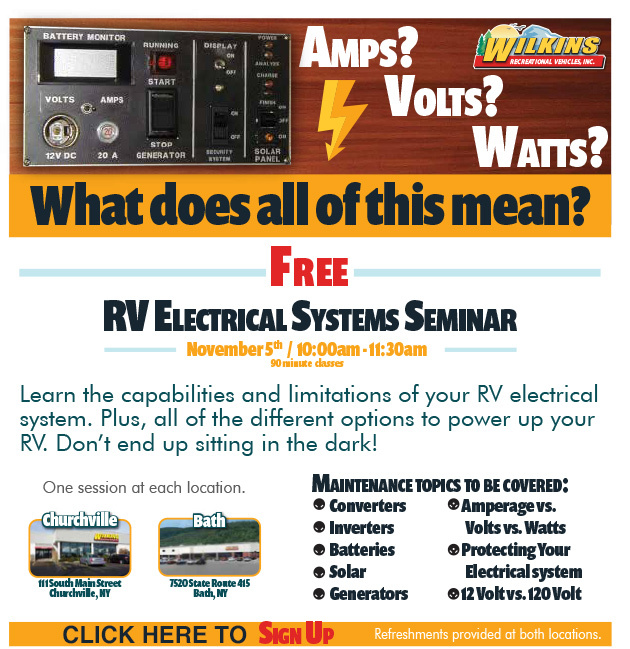 On November 5th, 2016, we will be having our next seminar, and in it, we will be covering the electrical systems of your RV. There will be a session at both our Bath and Churchville locations, so be sure to sign up here to take part in the seminar nearest to you. Check out our Electrical Seminar on November 5, 2016! With terms like amps, volts, and watts, there are so many things that you can learn about the electrical system of your RV, and it is important to your safety and the wellbeing of your camper that you know everything you can about it. In this seminar, we will be covering things like the capabilities and limitations of your RV Electrical System to make sure everything is running properly. There are also many different types of maintenance that you will need to perform on your RV’s electrical system. Therefore, we will be talking about each of these items including: converters, inverters, batteries, generators, and so much more! You will not want to miss out on any of this information. If you have any questions concerning this seminar, be sure to call toll free at 800-724-2105 and ask for Tammy or Kim. They will have all of the information you need7. Remember you must RSVP that you will be attending the seminar in order to get a space, so make sure you sign up. Then, get ready to go to the location you signed up for on November 5th, 2016 from 10AM to 11:30AM. While you are here, you can also look inside any of the travel trailers, fifth wheels, toy haulers, and more that we have on our lot.